A key feature of our investment framework, ERAA (Economic Regime-based Asset Allocation), is that it keeps each individual customer’s risk profile constant throughout any economic condition by intelligently and systematically re-allocating assets in portfolios when the economy or the markets change in a meaningful way. This process of proactively determining new asset allocation targets for any given portfolio is what we call “re-optimisation”. Re-optimisation is not to be confused with rebalancing, which is a process of returning an asset allocation back to its target. Rebalancing is typically necessitated by significant outperformance of a certain asset relative to the rest of the portfolio. Re-optimisation, however, is necessitated when the portfolio target asset classes allocations need to change in order to perform well in new macroeconomic or market conditions. Re-optimisation can be triggered by one of three events: (i) a change in economic conditions, (ii) a change in the valuation of one or more asset classes, or by (iii) a triggering of ERAA’s risk shield. StashAway will re-optimise a client’s target portfolio in the case that there is a change in economic conditions. Investors can expect changes driven by this event to occur every 3-7 years, and for the changes to be significant. In turbulent times (e.g., 2008), changes could be more frequent. ERAA continuously monitors what economic regime is at play, where we define an economic regime as a function of the rates of change in both growth and inflation. We recognise four distinct economic regimes: (i) recession, (ii) healthy growth, (iii) inflationary growth, and (iv) stagflation. The returns and risk profile (or volatility) of each asset class varies significantly across these economic regimes; this is why it is crucial to adjust the composition of any investment portfolio when the economic regime changes. To understand how asset classes perform differently depending on the economic regime, consider this: Large Cap US Equities (S&P 500) return on average 16% per annum in times of healthy growth, and lose on average 10% per annum in a recession. To further our point that asset classes’ performances depend on the economic conditions at play, we’ll add that the S&P 500’s volatility (or risk) increases significantly in a recession, going from 14.7% average annual volatility in ‘healthy growth’ to 19% in average annual volatility in a recession. 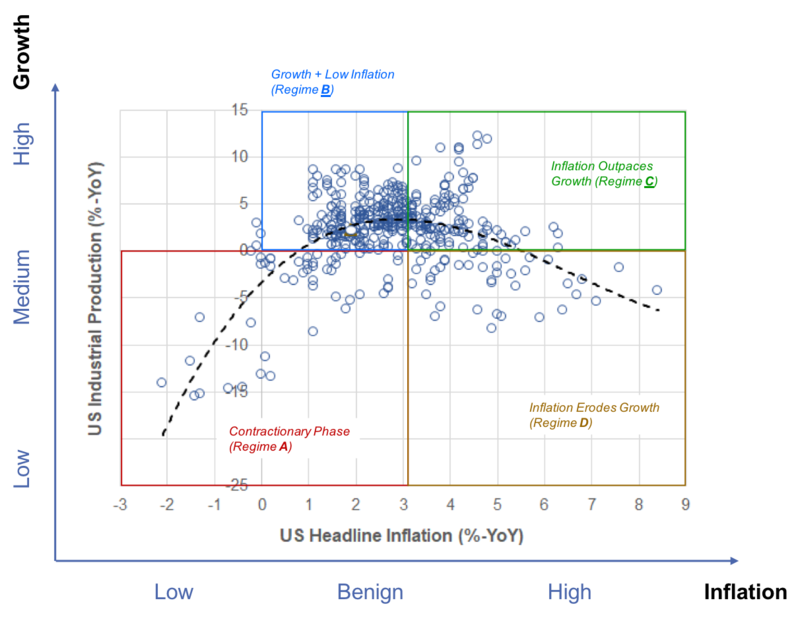 Generally, equities are expected to perform well when growth is positive and running with greater momentum compared to inflation. However, not all stocks are equal. For instance, In “good times,” small-cap growth stocks will outperform stocks in defensive sectors, such as consumer staples. Conversely, when the economy contracts, defensive stocks will likely fare better than growth stocks. On the other hand, protective asset classes, such as Gold or government bonds, perform at their best when the economy is doing poorly, and experience reduced returns in good times. Additionally, a few asset classes, such as inflation-linked bonds and emerging market equities, have the ability to protect against inflationary pressure. It takes the ability to identify economic regimes as well as understanding how different asset classes perform, and then putting together the appropriate asset allocation, in the given regime to be able to enhance a portfolio’s long-term risk-adjusted return. When the economy moves from “healthy growth” to a “recession”, for example, an optimised portfolio will decrease its equity exposure and increase the allocation to fixed income (bonds) and Gold, and the equity portion will contain more defensive sectors (e.g., consumer staples: people keep buying rice and toothpaste even in a recession). At times, economic data can be unclear, for instance when growth is around 0%. In those cases, StashAway’s framework acknowledges the uncertainty, and deploys an “All-Weather” strategy, optimised to protect capital and perform well in a multitude of different scenarios. StashAway will re-optimise a client’s portfolio when any asset class is excessively overvalued or undervalued. In the first case, ERAA will recommend a reduction in the exposure to the asset class, while in case of undervaluation, StashAway will adjust upward the expected future returns and therefore increase the allocation toward the asset class. Investors can expect changes driven by valuation adjustments to happen once or twice per year, and for the changes to be focused on 1 or 2 asset classes each time. To illustrate how this works, let’s check out an example of a time we readjusted portfolios to account for the difference in valuation. In December 2017, our systems flagged significant undervaluation in Gold; moreover, the momentum for Gold had turned, and the asset class had started gaining value. This triggered the re-optimisation of growth-seeking portfolios where the algorithm would increase allocations to Gold. This was done by selling other assets that were relatively expensive while keeping portfolio’s risk level constant. Not all portfolios were re-optimised: in this case, conservative portfolios on the platform were not affected because the changes would have been immaterial. So, how did the system determine that Gold was undervalued? Let’s look at the valuation adjustment for Gold in Figure 2. The system looks at how an asset’s mean return is performing versus economic factors over a given time horizon. The red line represents the rolling 7yrs total returns of Gold over the last 20 years; the black line is the fair (or “model”) rolling 7yrs total return of Gold according to ERAA’s valuation model, based on economic analysis. We are most interested in the difference between actual and model so that we can assess the valuation gap for Gold versus economic fundamentals. 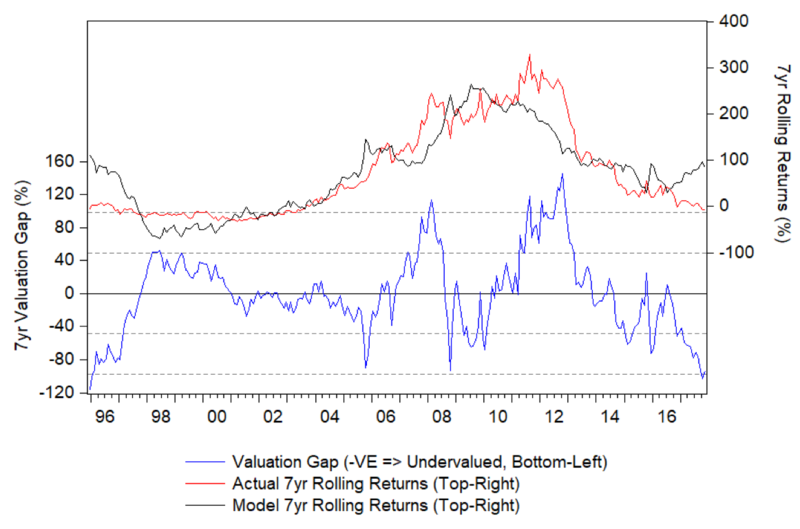 This valuation gap is depicted as the blue line that can be found at the bottom of Figure 2: gold is undervalued with the blue line showing a 2 std deviations distance from the fair value. As historically the valuation gap has shown a clear “reverse to mean” behaviour, with the blue line always trending toward the mean, after Gold’s momentum turned, it is safe to assume its medium-term returns will be higher than historical. The third and last case in which StashAway re-optimises its clients’ portfolios is when ERAA’s Risk Shield is triggered. While the first two cases have a monthly frequency, ERAA’s Risk Shield is checked daily and can be triggered at any time. The system continuously monitors the markets’ behaviours, and is built to react immediately to any unexpected shock. Through the use of a few technical analysis techniques such as “death crosses”, ERAA’s framework is able to acknowledge if the markets cease to follow economic data and is able to react promptly before a significant crash happens. In addition, ERAA monitors market expectations of future interest rates on a daily basis for signs of a turn in sentiments on the economy. If any of these signals turn negative, StashAway re-optimises client’s portfolios immediately to an All-Weather strategy, until either the markets situation has returned to normal or the macroeconomy has adjusted. In practice, the framework is built to read signals that a significant market crash is becoming probable and to react promptly to protect clients’ capital. The Risk Shield overrules the economic-driven parts of the model. StashAway’s reoptimisation feature is built to protect customers’ capital by maintaining risk constant throughout different economic and market cycles. ERAA leverages a multitude of different data to manage portfolios systematically, and to continuously control that asset allocations are optimised. Ultimately, ERAA’s goal is to maximise customer’s long-term returns while maintaining volatility (risk) constant at the right level for each individual customer.